Is email all you seem to do at work? Email costs North American businesses nearly $2 trillion annually – a huge amount of money. Collaborations specialise Contatta has published an infographic showing just how much American businesses pay employees to process email. Workers spend on average 13 hours of their workweek reading and answering email – around 637 hours annually. Collectively, employees spend nearly 75 billion hours in email. This costs businesses nearly $2 trillion in salaries. That is around 14 times the combined wealth of Bill Gates, Oprah and Warren Buffett. That amount of money could give everyone in the US with $5,637. But we would have no email! Data and statistics were pulled from the US Bureau of Labour, McKinsey Global Institute and the Radicati Group to showcase the ineffectiveness of email and the way we process things. So why do we still send emails instead of communicating using instant messaging tools such as Chatter, Lync, and Yammer? Like the memos of the past, we seem to think that email gives us the permanence of a written memo. We have an audit trail and an ‘official’ message that can be printed out and faxed or posted to anyone. Actually, instant messaging and other collaboration tools can do this as well. Firewall filters can be applied to block unsuitable messages, or messages filled with profanities or other undesirable keywords. All messages can be archived and audited and processed like their email alternatives. We need to change our behaviour. but after over 20 years of electronic messaging – it is going to be a long hard slog to embrace true social business. This entry was posted in Collaboration, Social Business and tagged collaboration, email, Infographic, messaging, office working, Social business on June 17, 2014 by eileenb. I was invited to go on TV the other day.My blog post for ZDNet about yahoo’s no home working rule generated a lot of comments. I agreed with Yahoo’s decision to change the working condition for its 200 home workers and get them to come into the office. I’ve worked from home regularly over the years – but I’ve never had to work entirely from home. Some of my friends at HP are classed as home workers who never go into the office and they tell me they find it lonely and isolating. I was asked to talk to Canada AM, which is Canadian Television Network (CTV’s) national morning show. I went into London for the interview – with 1/2mb at best, doing the interview over Skype would have been so painful. 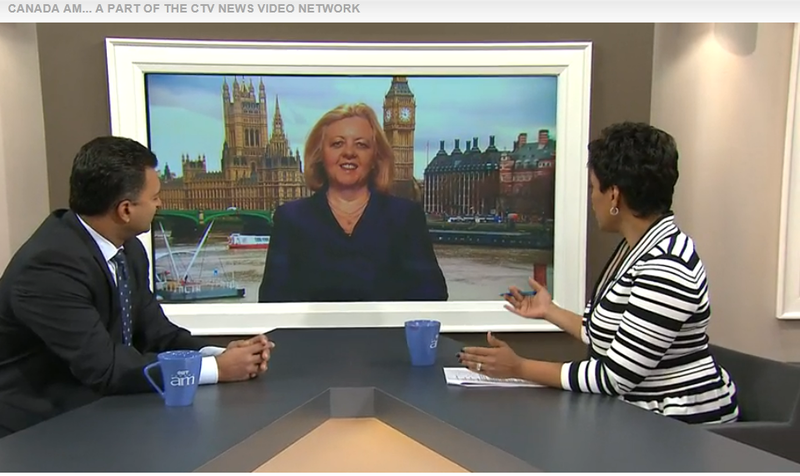 Marci Len was the host for the piece, sitting in Toronto with Nitin Kawale, President of Cisco in Canada. CTV have a studio in London with a TV camera to talk to the show. The camera was in a side room. I sat on a chair with my feet resting on a step stool. The backdrop of London was behind me. Unlike normal video conferencing I had no video feed into the room. My TV debut was a surreal experience. Sitting in the dark staring into a camera with no visual clues as to what was happening at the other end made for a really strange interview. Normally I can tell by watching body language, when it is appropriate to interject. I could not see Marci’s nods and smiles. I had only an audio feed. I had to wait for direct questions to be asked. I could not interrupt, my body language was hidden from view when Nitin spoke and the fact that i was not actually in the room in Toronto meant that i had much less opportunity to talk and contribute to the conversation. In fact this experience gave me much less opportunity to virtually interact than web conferences usually do. I felt out of the loop, isolated and out of touch with the discussion — exactly the feelings that permanent remote workers feel without the experience of face time in the office. I was not drawn into the conversation as much – in fact Nitin, in the studio got over twice the opportunity to state his views than I did. The lack of face to face connections made things incredibly difficult to really engage. This type of interview was so much harder than any telephone conference I’ve ever done – more so because it was on. TV. Would I do another TV interview? Of course. Would I prefer an ‘in studio introduction?’ heck yeah. But if I had to do another interview without any visual feedback at all, I’d make sure that I treated it just like a telephone call – and get the extra few sentences in that I really wanted to say! This entry was posted in Collaboration and tagged canada AM, canada tv, home working, remote working, tv interview, videoconferencing on March 14, 2013 by eileenb. I like the concept of Threadflip. It is a social marketplace where you can sell your old clothes and accessories, and browse for fashion that suits your style. 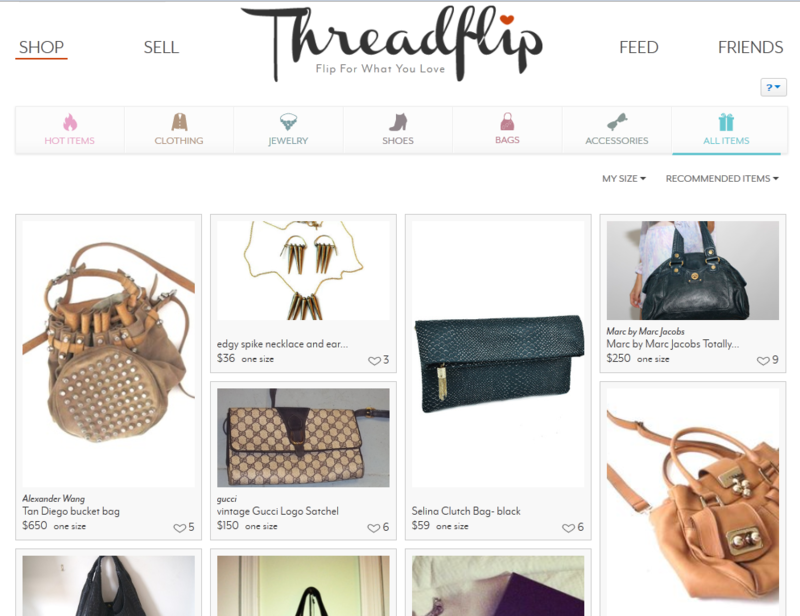 As a start up, Threadflip relies on investors, and has just secured a $1.3 million round of investment. It competes with other social shopping sites such as Poshmark, and eBay. It is currently available to buyers and sellers in the US only, but has plans to increase its reach worldwide. Users can sign in with Facebook, upload images of items that they would like to sell. If the item is sold, the seller then ships the goods to buyers.Threadflip takes 15 per cent from the sale of each item. if you have not time to do the selling yourself, Threadflip offers a white glove service. They take care of the sale for you, and send you the cash from the sale. One of the great advantages of social marketplaces is that buyers can share information about items that they intend to purchase, or have already bought. The concept is like a collaborative swap meet, you sell and buy from people with same style as you. Its a good idea – especially for female netizens who like to shop and share online. This entry was posted in Collaboration, Community, Social Commerce, Social Networking and tagged collaboration, Commerce, selling, social commerce, social marketplace on April 18, 2012 by eileenb. What does it take to make your business more social? But with access to your information from anywhere, any device, you can work anywhere. Cisco have released a video which shows this concept rather well..
Access from any device, at any time, any location. Get the information you need, on the form factor you need, in the way you need. Collaborate in the way you want to, on the phone, face to face, via email or video. The opportunities are endless. Clouds work for small businesses — that don’t want the overhead of managing the infrastructure. The cloud also works for large businesses too. MyStarbucksidea runs in the cloud on Salesforce.com. The flexibility in working where you want to means that travel budgets can be managed effectively. There is no overhead in time lost commuting, nor any extra resources used. Make your business more social – move your infrastructure to the cloud. Any cloud. The Amazon cloud, the Google cloud, the Cisco cloud, the Microsoft cloud. This entry was posted in Cloud, Collaboration, Sustainable Business and tagged cloud storage, collaboration, Social business, Sustainability, Sustainable business on March 7, 2012 by eileenb. Domino’s has empowered its user community to steer the direction of the brand by launching its new crowdsourcing app, ‘Think Oven’ on Facebook. The Project area encourages comments and suggestions around a current project – at the moment its around the Domino’s uniforms. The Idea box is a place for suggestions – that might turn into future projects. The idea mirrors the My Starbucks Idea project that has been running for some time now. Although we celebrate community collaboration like this, Crowdsourced ideas are not new. Back in the ‘olden days’ the company suggestions box had the potential to turn up some innovation. Now everything is done online. With voting, comments and suggestions enabled in the Domino’s app the brand can get a really good idea about what its fans really want. 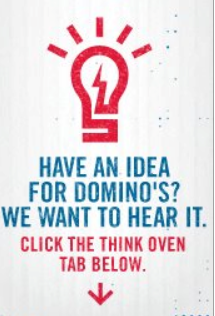 Using the army of Facebook fans to garner ideas is a good move for Domino’s. We are used to interacting on Facebook, we are much more likely to interact with the brand in this way. This entry was posted in Collaboration, Community, Crowdsourcing, Innovation and tagged collaboration, Crowdsourcing, Domino's Pizza, Innovation on February 15, 2012 by eileenb. We tend to ignore things that are sent to large groups of people. The Reply All email must be relevant to someone else if it’s not intended directly at you. Can you trust everyone on the ‘To:’ line not to propagate the message further? Is the message actually meant for each of the recipients? 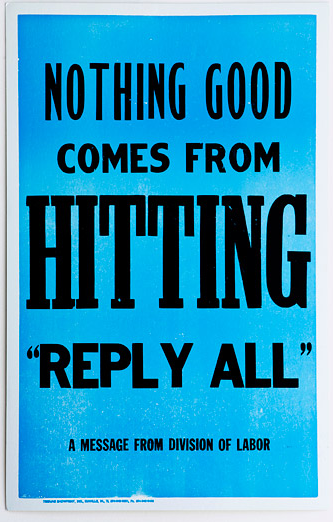 Are you wasting their time Replying to All? This entry was posted in Collaboration, Productivity and tagged email management, productivity on January 5, 2012 by eileenb. The Vgo device is a robot with a difference. It is 4 feet 6 inches tall, communicates over 4G and can conduct 2 way audio and video conversations through a 5 inch screen on its head. 5 of these robots are being used in a pilot program at the Childrens hospital in Boston. The intention is to reduce the frequent trips back to hospital for check ups after an operation. It replaces hospital monitoring with home based monitoring. The robot goes home with the patient. When at the patients home, the robot is controlled by staff at the hospital who remotely drive the robot around in the house. Vgo was designed by a team that specialises in video communication and robotics. They allow remote telepresence wherever you are. You don’t need to be in front of your computer to interact with a remote user. As long as you can be seen by the robot, the other party can interact with you. If this pilot scheme works, the hospital plans to expand to a 40 patient home trial to see how effective this type of care can be. It already works well with remote teaching methods for children who are unable to attend school and it brings interaction through technology innovation. Telepresence robots are evolving and bringing other senses such as long distance touch to the 2 way interaction. Bring in the robot with the human face and intelligent conversation and before long, we’ll have realistic looking avatars interacting with us. Blade Runner as a reality by 2019 anyone? This entry was posted in Collaboration, Robotics and tagged Artificial Intelligence, Blade Runner, Future, robots on December 16, 2011 by eileenb.